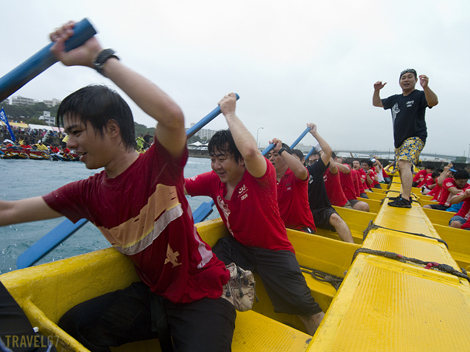 I got the opportunity to take photos of the dragon boat races today. I took along the new 25mm lens I’m trying out hoping to get some interesting shots. It quickly became clear that the weather was not going to be favorable and it went from drizzle, to light rain, to downpour over the course of an hour. Everyone was soaked, but I was still keen to get at least a few pictures of the event. I kept the camera and lens in an Ortlieb bag until the race began and then worked on the assumption that the weather sealed body and lens would stand up to a few minutes of rain. The camera and lens survived their ordeal without any problems, and I have a few photographs of life in the Okinawan rainy season. Great job mate! Bummer about the rain. Was it hard to get on the Hari? Nice prospective! Must have been fun. Hi Pete, I was like a drowned rat! 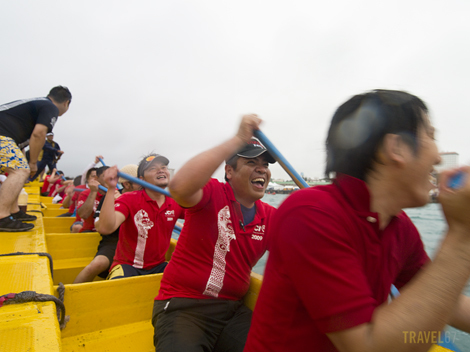 I managed to get on one of the boats after asking a friend who was taking part. As long as the crew don’t mind carrying some dead weight then there’s a chance you can get on and take photos.